We’ve previously observed that we can view the world through both a factor and a sector lens, but what about overlaying sectors and style? This is indeed possible, as sectors can serve as implementation vehicles to achieve a particular view on style. 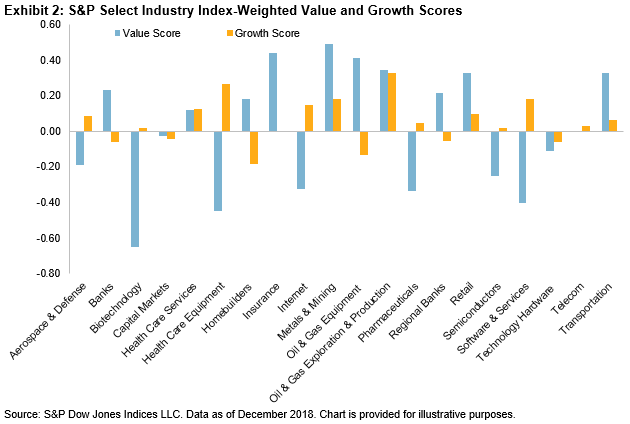 Using value and growth scores that are reset annually for every constituent within the S&P Total Market Index, Exhibit 1 plots the 11 S&P 500® GICS® sectors on the value versus growth spectrum, calculated as an index-weighted average score at the sector level. The size of the bubbles is proportional to the market cap of the sectors. For example, Information Technology is the biggest bubble, as it has the largest index market cap among sectors (and it also has the lowest value score). Meanwhile, Financials, the third-largest sector by market cap, has the highest value score along with the second-highest growth score. 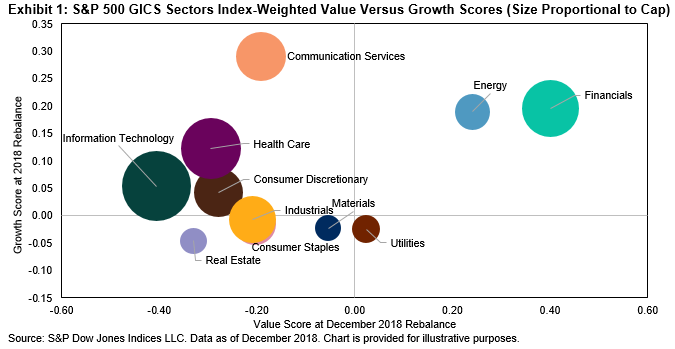 Investors looking to access value and growth can do so through sectors such as Energy and Financials (the far right side of Exhibit 1). Meanwhile, for those who seek to take a more singular growth bet, the new Communication Services sector is a natural option. We can similarly apply a style lens across industries. Exhibit 2 shows that high value exposure is prevalent in Insurance and Metals & Mining, while we observe a greater growth tilt for Oil & Gas Exploration & Production and Healthcare Equipment. Investors can achieve style exposures through sectors and industries, and it is useful to understand how these dimensions interact with each other. What Is So Important About Business Cards? Binary Money Manager Review! Is it reliable trading System?